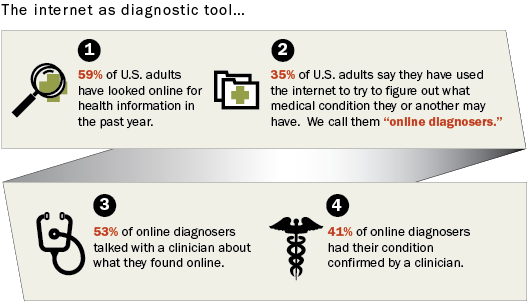 41% of online diagnosers say a medical professional confirmed their diagnosis. An additional 2% say a medical professional partially confirmed it. 18% say they consulted a medical professional and the clinician either did not agree or offered a different opinion about the condition. 1% say their conversation with a clinician was inconclusive. Women are more likely than men to go online to figure out a possible diagnosis. Other groups that have a high likelihood of doing so include younger people, white adults, those who live in households earning $75,000 or more, and those with a college degree or advanced degrees. 26% say they read or watched someone else’s experience about health or medical issues in the last 12 months. 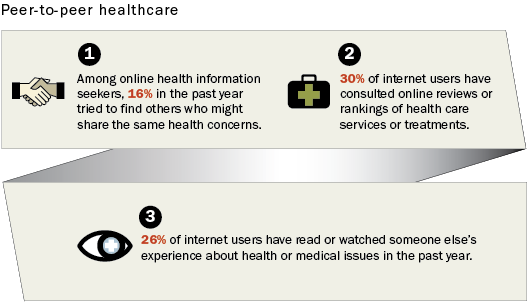 16% of internet users say they went online in the last year to find others who might share the same health concerns.